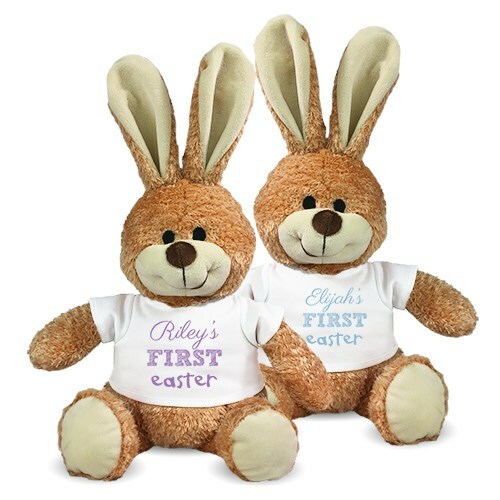 Personalized First Easter Bunny - 12"
Celebrate your baby's first Easter with this lovable plush keepsake. This Cuddle Pal Bunny makes for a fun loving gift idea for any baby. He features an overstuffed belly for extra cuddling and embroidered eyes & mouth to make him kid friendly. This stuffed animal has contrasting velvety fur on the inside of its ears, mouth and feet. Bunny measures 12” from head to feet, ears measure 4.5" and is surface washable. Free personalization of any name and design color is included. Free gift wrapping and a free gift message are also included to create a thoughtful presentation. Additional Details Make this first Easter a fun event for the entire family with our Easter Plush Collection. Ever family member can have their very own plush Easter bunny that adds to their Easter baskets!